Bournemouth moved eight points clear of the Premier League relegation zone with a convincing win over Southampton. The visitors wasted an early chance when Charlie Austin side-footed wide, and they struggled to match the intensity of their local rivals. 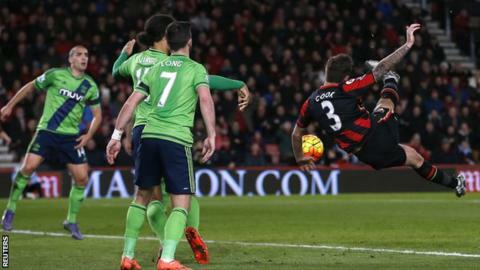 Bournemouth took the lead when Fraser Forster parried Matt Ritchie's free-kick and Steve Cook volleyed in. Benik Afobe settled the Cherries' nerves when he headed in at the near post from another Ritchie free-kick. The victory was Bournemouth's first over Southampton in the league since 1958. Just before half-time, fourth official Kevin Friend collapsed and hit his head on a dugout. He cut his face in the fall and was treated in the tunnel before being taken to hospital. Before this round of fixtures, Bournemouth were the Premier League's highest scorers in the first 15 minutes of matches - and a fast start was key to this victory. The home side were more tenacious than their visitors and were eventually rewarded with the opening goal as defender Cook scored for the second time this season. Ritchie's delivery for both goals was impressive and while the Cherries were on the front foot in the first half, they showed their dogged side after the break to earn only their fourth home win in the league this season. "In previous games we haven't got the goals when we have been dominant," said manager Eddie Howe. "The whole team functioned, and when we play well we are a difficult team to beat." Howe had talked of a "defining" period in his side's season before the game, which is followed by matches at relegation rivals Newcastle and Swansea. Meanwhile, winger Max Gradel, making his first start since suffering cruciate ligament damage during a 1-1 draw against Leicester on 29 August, showed no ill-effects in an 85-minute run-out. Southampton have scored just six goals in their past 10 Premier League away matches - and they rarely threatened at the Vitality Stadium. Manager Ronald Koeman was forced into a tactical change early on, switching from 3-5-2 to 4-4-2 in order to reinforce his midfield as his side were overrun. Saints came into the game more but still failed to create chances as strikers Austin, Shane Long, Sadio Mane, and Graziano Pelle made limited impact. At the other end, Koeman's side have conceded three successive goals from set-pieces, with Chelsea's late winner on Saturday coming following a corner. Bournemouth boss Eddie Howe on picking striker Joshua King after his partner gave birth on the morning of the match: "I was very pleased for Joshua. It's an emotional moment having a child. It can either drain your or inspire you, and I think it inspired him. "I'm not sure how much sleep he's had over the last few days. I think he's been economical with the truth with me as he'd said he'd had plenty." Southampton manager Ronald Koeman: "We've played this system for several weeks - the system is perfect if you play against two strikers. But I had to recognise the left full-back of Bournemouth [Charlie Daniels] was very good. He created a lot of problems. "But there was a big difference with the way Bournemouth started the game. They were hungry and winning challenges, we didn't. That's not tactics - that's belief, spirit, character, mentality." After keeping six clean sheets in a row this season in the Premier League, Forster has conceded four goals in his past two games. Five of the Cherries' past eight Premier League goals have either been scored or assisted by defenders (one goal by Cook, one goal and three assists by Daniels). Afobe has scored four goals in his eight Premier League games this season. Bournemouth have kept consecutive Premier League clean sheets for the first time this season. Koeman's side have scored just three goals in their past seven away league games. Bournemouth travel to fellow strugglers Newcastle on Saturday (15:00 GMT) and will hope Southampton, who are home on the same day, can do them a favour by beating Sunderland (15:00 GMT). Match ends, Bournemouth 2, Southampton 0. Second Half ends, Bournemouth 2, Southampton 0. Corner, Southampton. Conceded by Adam Smith. Attempt missed. Dan Gosling (Bournemouth) right footed shot from outside the box misses to the right. Attempt saved. Sadio Mané (Southampton) right footed shot from the centre of the box is saved in the centre of the goal. Assisted by Oriol Romeu with a through ball. Hand ball by Jose Fonte (Southampton). Attempt saved. Lewis Grabban (Bournemouth) right footed shot from outside the box is saved in the centre of the goal. Assisted by Dan Gosling with a headed pass. Max Gradel (Bournemouth) wins a free kick in the defensive half. Corner, Bournemouth. Conceded by Jose Fonte. Goal! Bournemouth 2, Southampton 0. Benik Afobe (Bournemouth) header from the centre of the box to the high centre of the goal. Assisted by Matt Ritchie with a cross following a set piece situation. Benik Afobe (Bournemouth) wins a free kick on the right wing. Offside, Southampton. Cédric Soares tries a through ball, but Graziano Pellè is caught offside. Attempt missed. Graziano Pellè (Southampton) right footed shot from outside the box is close, but misses to the left. Assisted by Steven Davis. Substitution, Bournemouth. Lewis Grabban replaces Joshua King because of an injury. Substitution, Southampton. Dusan Tadic replaces Shane Long because of an injury. Substitution, Bournemouth. Dan Gosling replaces Harry Arter because of an injury.